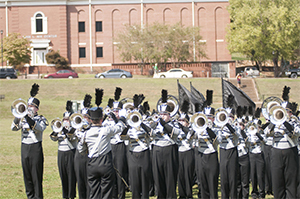 The Golden Eagle Band is the oldest organization on the University of North Georgia campus. Formed in 1873 as a part of the Corps of Cadets, the Golden Eagle Band has a long and rich heritage as the marching band here at the University of North Georgia. Unlike most high school marching bands who perform for football half-times and in adjudicated marching contests, the GEB's primary duty is to provide ceremonial music for the Corps of Cadets and to represent the University in parades around the region and the nation. Two of the major contributors to the Golden Eagle Band's success are the unit's strong sense of cohesion and its respect for tradition. The freshmen bandsmen, referred to as fledglings, steadily evolve into Golden Eagles first by earning the Golden Eagle Band Patch and then through bonding together into the Brotherhood of the Cord. For more information contact Dr. Bart Walters at bart.walters@ung.edu.